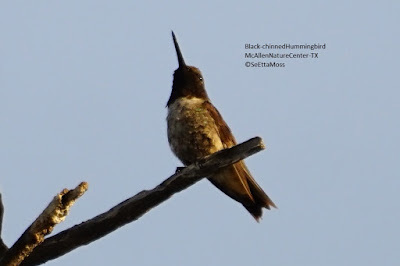 Yesterday I watched a male Black-chinned Hummingbird performing several Display Dives that Birds of North America online (fee site) says, "...during breeding season Dive Display assumed to be a component of courtship." Right after the dives it flew off into the vegetation. While I only saw the hummer in flight I did see the purple band at the bottom of it's black chin clearly when the light hit it just the right way. 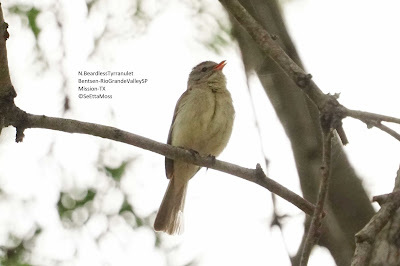 I checked references and though this species is present in the Lower Rio Grande Valley during breeding season there are not a lot of records of that. 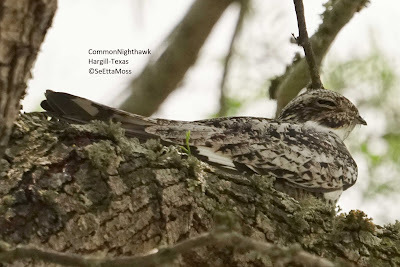 I was doing a little exploring and car birding yesterday driving slowly through this little rural town in the Lower Rio Grande Valley when I spotted this nighthawk sleeping on a branch of a tree. Their plumage tends to camouflage them when they roost in trees. Contrary to it's name these birds are most active during dawn and dusk but also may be out during the day and at night. Since there are Lesser Nighthawks in this part of the country I had to check to see which of the two, Lesser or Common, this was. I identified this one as a Common Nighthawk given that the white band on it's wings is not beyond the tertials as occurs with Lessers, in fact much before them. This little bird has been a nemesis bird for me-- that is, a bird that has eluded me despite multiple efforts to see it. And it has been being seen by many other birders in the places I looked unsuccessfully for it. Now I did get glimpses of it a few times, but not the kind of viewing that I want for a lifer bird. 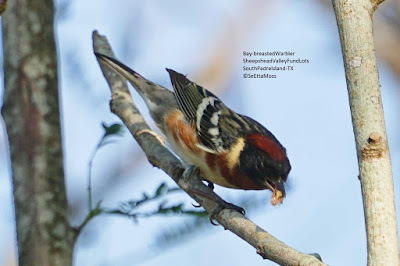 So I was delighted when I saw the adult bird coming to it's nest at Estero Llano Grande State Park. That sighting only whetted my appetite to find one of these and get a little video as well as better pics than I got at that nest area. So I was delighted when I heard this tyrannulet singing day before yesterday at Bentsen-Rio Grande Valley State Park. I got the bottom 4 pics from that sighting but no video. So I returned today and quickly heard this male bird singing. I got the top 2 pics today and the very short video clip at the bottom. 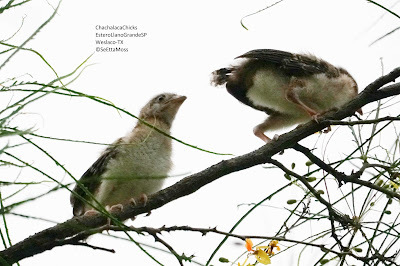 When I first spotted these young birds climbing in the branches above I had no idea what species they were but the mystery was soon resolved as the nearby adult Chachalacas decided I was too close--so they began their raucous calling and a couple came in near the chicks. While adult Chachalacas have pretty cute faces, they frequent loud calling which is usually done by multiple birds diminishes their popularity. These young birds did not emit any vocalizations while I watched them for almost 10 minutes.